JetBlue announced it has ordered 60 Airbus A220-300 aircraft – previously called the Bombardier CS300 – for delivery beginning in 2020, with the option for 60 additional aircraft beginning in 2025. The order follows JetBlue’s intensive review aimed at ensuring the best financial performance of the airline’s fleet while providing maximum flexibility to execute its network strategy and enhancing its industry-leading customer experience. As part of the agreement, JetBlue has also reshaped its Airbus orderbook, including converting its order for 25 A320neos to the A321neo and adjusting the delivery schedule. 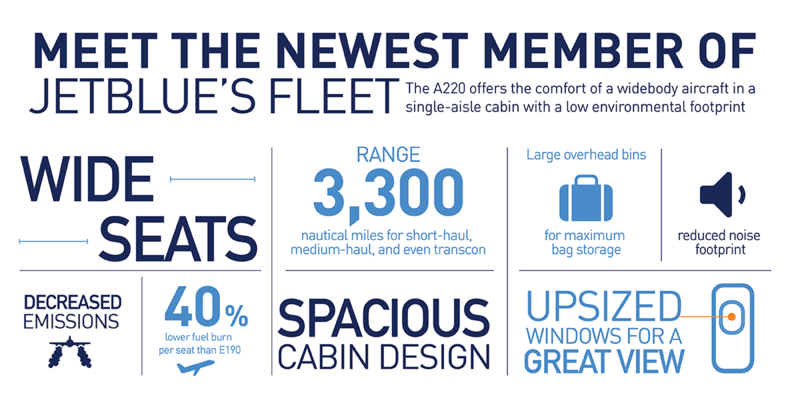 The A220-300’s spacious and comfortable cabin makes it the perfect fit for JetBlue, which has consistently led U.S.airlines in the onboard experience. The A220’s cabin design offers customers the best inflight experience with wider seats, spacious overhead bins and extra-large windows that offer a great view from the sky and on the ground. 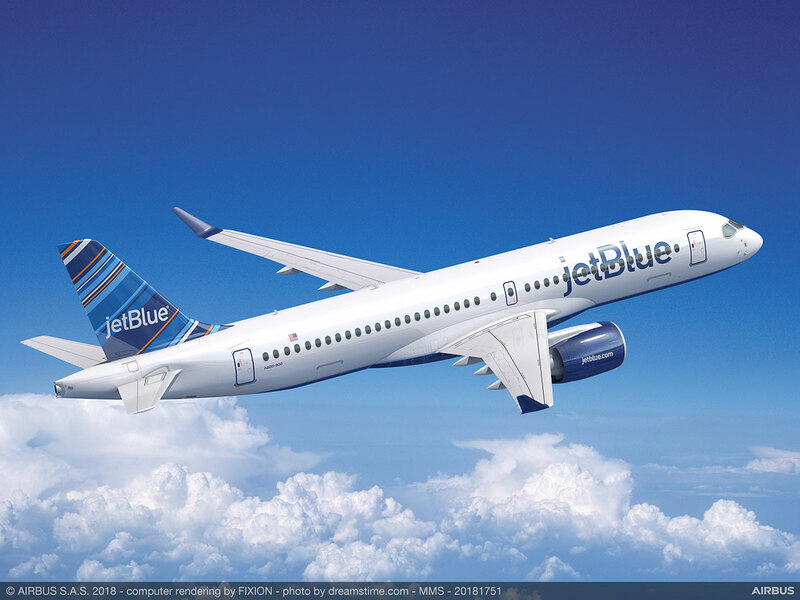 JetBlue plans to phase in the A220-300 as a replacement for JetBlue’s existing fleet of 60 Embraer E190 aircraft. The aircraft’s range and seating capacity will add flexibility to JetBlue’s network strategy as it targets growth in its focus cities, including options to schedule it for transcontinental flying. The aircraft also opens the door to new markets and routes that would have been unprofitable with JetBlue’s existing fleet. While the E190 has played an important role in JetBlue’s network since 2005, the airline’s fleet review determined that the A220’s economics would allow the airline to lower costs in the coming years. The A220 was designed by previous manufacturer Bombardier to seat between 130 and 160 customers, enabling financial and network advantages over the current 100-seat Embraer configuration. 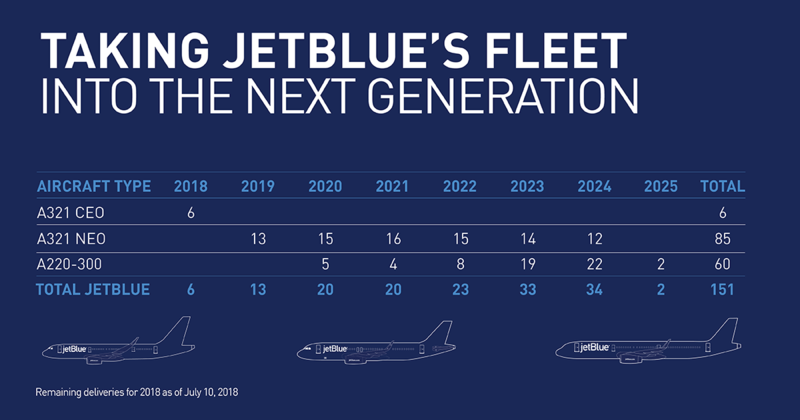 JetBlue plans to take delivery of the first five aircraft in 2020, the airline’s 20th year of service. Deliveries will continue through 2025. JetBlue expects it will begin to reduce flying with its existing fleet of E190 aircraft beginning in 2020. The phase out will continue gradually through approximately 2025. Options for 60 additional aircraft begin in 2025, and JetBlue retains flexibility to convert certain aircraft to the smaller A220-100 if it chooses. Both members of the A220 Family share commonality in more than 99 percent of their replaceable parts as well as the same family of engines. JetBlue’s A220 aircraft will be assembled in Mobile, Ala.